Presumably, you know someone who doesn’t eat meat or animal products at all. In the last years, becoming vegetarian or vegan is rising in popularity. Companies, restaurants and stores can’t ignore it, they have to modify their assortment in order to not lose customers. And yes, they are doing this. For example, Ben & Jerry’s introduced two vegan ice cream flavours. This is due to the huge demand of the customers. Ben & Jerry’s communicated with their consumers and they concluded that the interest in vegan ice cream was great, whether concerning a plant-based lifestyle or from being lactose intolerant. The company collaborates with Vegan Action in the United States to make sure that the vegan flavours, Chocolate Fudge and Chunky Monkey, don’t contain animal products like eggs, dairy or honey (Boer, 2018). The ice cream is made on a basis from almond milk. After many investigations, Ben & Jerry’s succeeded to make the same taste and creamy texture as the non-vegan ice cream. Since the 30th of January 2018, the vegan ice cream can be found in Dutch supermarkets. (Ben & Jerry’s, 2018). Ben & Jerry’s are not the only company that are changing their product range. IKEA just announced a vegan hotdog (Petter, 2018) and Starbucks added vegan cupcakes in their store (Sentenac, 2017). In addition, New York Pizza and Dominos started to deliver vegan pizza’s (Kooijman, 2018) (Mirande, 2018). · To produce 1 pound of beef, 2500 gallons of water are needed (Pimental, et al., 2004). To produce 1lb. of eggs, 2477 gallons of water are needed and to produce 1lb. of cheese, 900 gallons of water are needed. To produce 1 gallon of milk, 1000 gallons of water are needed (Davis, 1991). · 45% of the earth’s total land is covered by livestock (Agriculture, Forestry and Other Land Use (AFOLU), 2014). · A farm with 2500 dairy cows is responsible for as much waste as a city of 411.000 people (U.S. Department of Agriculture (USDA), 2008). · The oceans could be fishless by 2048 (Worm, et al., 2006). · 91% of the destruction of the Amazon is caused by animal agriculture. (Margulis, 2003). · Each second, 1-2 acres of rainforest are cleared for cattle (Miller, 1989). · 82% of starving children worldwide live in countries where the food is fed to their animals. And the western countries eat these animals. So basically, we eat the food of starving children (Robinson, et al., 2011). As I said, these are only facts about the climate. We haven’t even talked about the animal abuse, the insane world behind your bacon and the health risks of eating animal products. So, the response of more and more human beings, human beings caring for the planet, stop eating meat and other animal products isn’t astonishing. Nevertheless, many people don’t think the entire world can be vegetarian or vegan. So why don’t we come up with a another solution for the climate? The answer is: a solution is already conceived, but it isn’t on the market yet. Winston Churchill proposed it in 1936: not breed a whole chicken, but breed the meat from every separate body part in a laboratory or factory. The consumer won’t notice any difference. Many years later, in 2013, Dutch pharmacologist Mark Post and his team developed the first cultured burger. In vitro meat works as follows: the laboratory takes a little piece of tissue from an animal muscle. Millions of cells are therein, which multiply to ‘become more muscle’. These cells will be placed in a grow box, called a cultivator. Within, the cells do exactly the same as they would do in the animal body, so they grow out to be real meat. Activist Paul Shapiro thinks it’s impossible to make the whole world a vegetarian, so ‘clean meat’ is mainly suitable for the real meat eaters who know they want to keep eating animal meat. These people can continue to do so, but without feeling guilty about the damage their causing by eating meat. This sounds like the perfect solution for all the animal suffering and environmental damage – doesn’t it? So why aren’t the supermarket’s shelves filled with in vitro meat? The problem is that people decry the ‘laboratory meat’, they abhor the idea of it. Remarkable, because it isn’t an alternative for meat, it is meat. Besides, after the first analysis, in vitro meat will be made in a factory, just like real meat. The next thing that has to happen is making clear to people that there’s no difference between in vitro meat and ‘ordinary’ meat. As soon as in vitro meat comes close to animal meat in terms of price and people know about the environmental benefits, most will prefer clean meat (Wu, 2018). Moreover, it’s a challenge to ensure that the in vitro meat actually reaches retail. It’s expensive: the first cultured burger amounted around $30.700 and when the market will be reached in 2020, a kilo will cost $74. Furthermore, several experiments have to be fulfilled, for example for the production method and how to make appetizing meat. Mark Post established the clean meat company ‘Mosa Meat’ and he’s not the only one who pursues goals like this. For example, Memphis Meats developed the first cultured meatball in 2016 and the Israeli ‘Supermeat’ has the ambition to culture chicken meat in machines which can stand at cafes and supermarkets. These companies all want to enter the market around 2020 and the science side also has this purpose. New Harvest, United States, is currently working on an investigation with five American and British universities. They are conducting a study on an assortment of products that can be made into ‘clean meat’ (Hosselet, 2017). ​We consider another solution. Jaap Korteweg from the Netherlands is the founder of ‘The Vegetarian Butcher’ and in contrast to most people, he thinks everyone can be vegetarian. No one will miss meat, as long as the substitute has the same structure and taste. Korteweg is honest: he hopes there’s no future for the ranchers. His dream is to make the whole industry of livestock farming unnecessary and wants to let everyone live on plant-based meat instead of animal meat. The idea of The Vegetarian Butcher is that in this age of technology, producing meat without animals has to be achievable. Regarding to animal welfare, as well as the climate, people have to get rid of their animal meat addiction. Last year, Korteweg opened his factory for plant-based meat only. They have a great turnover, but not enough to overshadow livestock farming. The purpose is to bring in 20% of the retail in 2030. Korteweg argues people won’t have to quit eating meat. He likes eating meat too, but plant-based meat. And as long as this has the same structure and taste, no one will miss the meat of animals (Bergh, 2018). So what will be the future of meat? Shall we eat in vitro meat massively, shall we all be vegetarian or will nothing change? I can’t look into the future, but I think it will be a combination of all of them. The demand for plant-based meat and in vitro meat will increase, so people can choose: eating an animal or eating plants. Because the developments won’t go quick and people need time to get used to changes, ‘normal’ meat won’t get out of the market within thirty years. For a while, the customer will have the choice to buy plant-based meat, in vitro meat and normal meat, until there’s no demand for ranchers’ meat anymore. Sounds like a positive future – doesn’t it? Yes, it does, for the earth and for the climate. Personally, I hope to see something else. I think it’s ridiculous and horrible that people use animals for their own cravings. 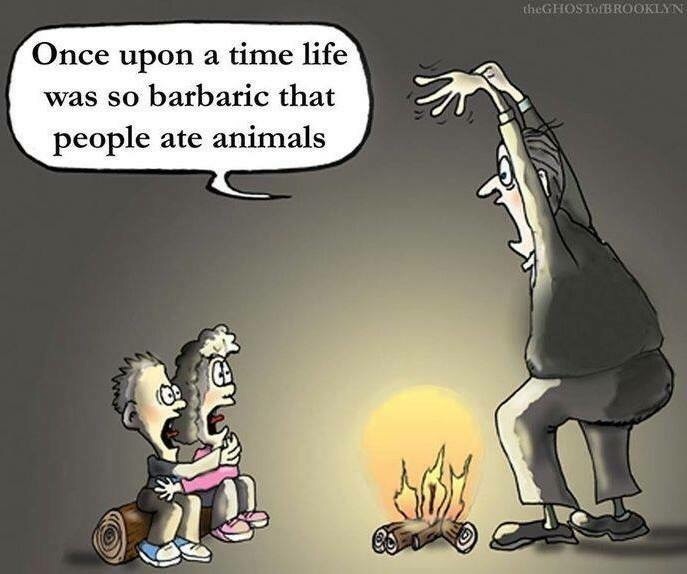 If you can do so much for the animals and the earth, and being a herbivore is so much healthier (watch ‘Food Choices’, ‘What the Health’ or ‘Forks over Knives’ if you want to know more about that), why do people still eat animal products? Because it tastes good. That’s it. Other reasons are excuses, because people know what they induce, but they don’t want to know it. Meat eaters deny and avoid it, purely because their own urgencies are more important than the planet. I could tell you so much more about this, but I’ll restrain my frustrations. What I want is that animals are no longer needed for anything, that people don’t use animals for their own needs. I want everyone to become a vegan. Sorry if you feel offended, this is my personal opinion and I hope this will be the future.